the message from a #COP21 Cross- Community Climate Summit! “Croke Park” the home of Gaelic Games and of the Gaelic Athletic Association (GAA) stadium with capacity of 82,300, making it the third largest stadium in Europe. The stadium is located in the North Inner City of Dublin which is one of the most deprived area of the Irish capital. ATD’s project #Croke21 – A Community Climate Summit aims to involve and mobilise people living in the Croke Park area in the debates and challenges of the COP21 Summit. It will also enable to a small group of young people from this area to join the civil society debates in Dublin and in Paris at the time of the COP21 Summit or in the days before it. Gather the voices of people living in the Dublin North Inner City about the Climate challenge faced by the world, with a particular priority given to hearing the voice of young people and adults facing marginalisation and harships because of life in consistent poverty. #Croke21 – A Community Climate Summit will take place on Saturday 28th November with discussions and creative workshops ! Voices of people from the community, the #Croke21 Declaration, will be brought to Paris by a delegate of ATD at the time of #COP21. Mobilise people in the Dublin North Inner City and the General Public on the climate justice debate. Young people from the area will attend a European debate on Climate Justice in Paris a few days before #COP21. They will be the leaders of the preparation of the participation of people from the Croke Park community area to the People’s Climate March on 29th November. In February 2016, a follow up meeting will be organised in the Dublin North Inner City after the Summit to discuss the responsibilities of each citizen to act on climate change and on justice. Hate cannot drive out hate; only love can do that! Because ATD Fourth World’s international center is located on the outskirts of Paris, messages of solidarity have poured in from our members and friends since the attacks on November 13. Some messages are from people in Beirut, still reeling from the attack there on November 12. Others made connections to situations they lived through in the United States on September 11, 2001, in Vietnam during the war there, or in Rwanda during the genocide. It’s heartbreaking how many lives were lost or shattered. I am praying for the victims – and also for those who may be victimized in the days ahead, as happened in London some years ago with a backlash against innocent people. We who reject racism and hate-mongering are ready and waiting, united and strong. With every attack, they make those of us who want peace stronger in our unity. The peaceful majority of Muslims cannot be blamed for the actions of a violent few. The Qur’an is a book of peace. May peace and light prevail over hatred and fear. Messages have poured in from friends in Egypt, Palestine, the Central Africa Republic, and many other places sending, as one said, “all the blessings and hope we can muster.” We also heard from a young woman in Kenya, where a terrorist attack in April killed 147 students. 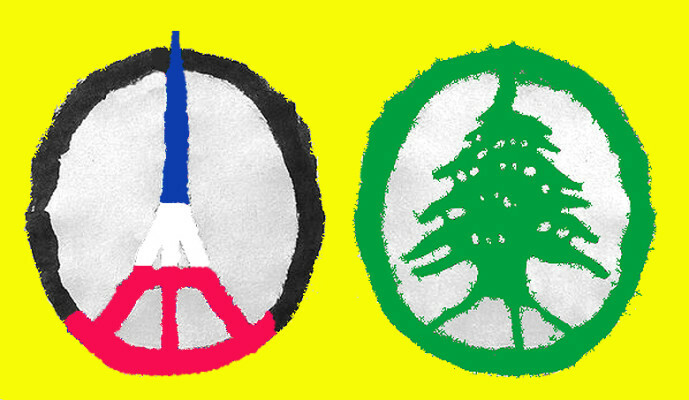 Lebanon and Paris are both in tears and mourning the dead. In some countries, attacks have become normal, and that’s tragic. To say my piece: it’s not a great idea to compare tragedies and question people’s reactions. The focus should be on comforting those in pain. When death hits anybody, the humanity in us should rise with those left behind and not be buried with the dead.